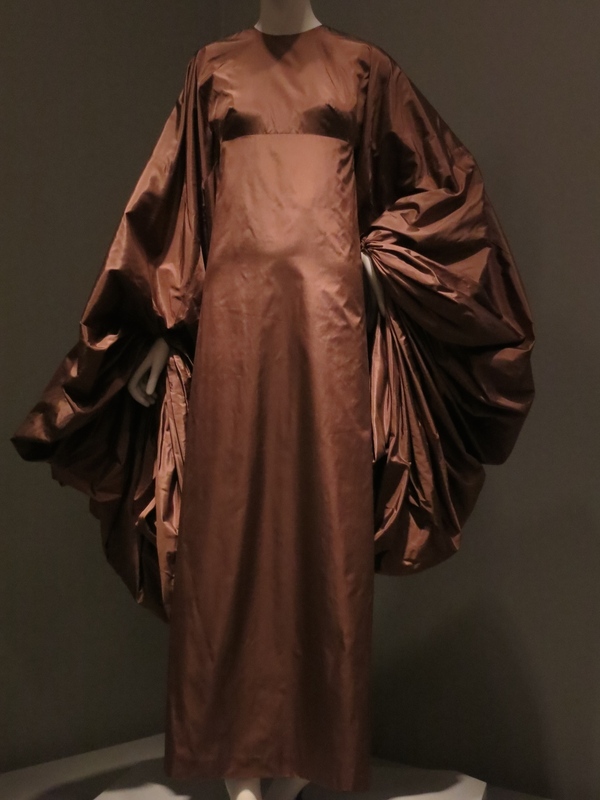 Madame Gres. The sleeves and bodice are all one piece. PietroYantorny shoes, 12 pairs incorporating the Rita Lydig's lace collection 1914. She had hundreds of pairs...These are day shoes. It's all about cutting, draping, using the right textile, with an incredible understanding of movement and the human form. This exhibit at the Legion of Honor, titled "High Style" is a small traveling exhibit from the Brooklyn Museum (now housed at the Met) with shoes/hats/dresses from 1900 to present-- European and American creativity. Some of the muslin patterns were included (cut in half. Did they take apart the other half as pattern for the real thing? ), as well as videos showing the layers beneath. No spandex here. I was inspired by the amazing folds, and consideration for form. And then there was the moire, wool on the bias, silk cords and a u-shaped pattern that was echoed in the hemline and the neck (U-shapes are Geoffrey Beene). I could find only one seam on this dress (armpit to waist) and one pocket. There are water-like folds and flourishes. One visible button, no zippers... Needs more investigation.